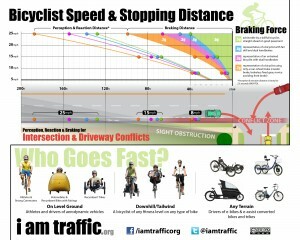 i am traffic»Education»What is a Courteous Cyclist? The issue of courtesy often comes up when bicyclists discuss traffic, especially when motorists are part of the conversation. Most bicyclists want to be respectful of others and to set a good example. However, different assumptions, experiences and knowledge about traffic bicycling can result in different opinions of what “courtesy” means. How can cyclists extend courtesies to their fellow road users, while prioritizing their own safety? We’ll answer that question as it’s addressed by cycling classes such as CyclingSavvy and BikeWalk NC’s Traffic Bicycling course. Courteous means “marked by respect for and consideration of others.” Courtesy is voluntary social behavior that exceeds our obligations under the law (such as stopping for red lights). Police cannot write traffic tickets for being rude; they are limited to the statutes that prohibit unsafe movements. All road users must cooperate with one another to avoid collisions; courtesy, however, is making the extra effort to improve the social environment of traffic and optimize the experience for everyone. When it comes to courtesy, we self-police according to our own judgment. As socially conscious travelers we try to apply the rule, “Do unto others as you would have done unto you.” We appreciate favors from strangers and try to do the same for them. But how big a favor should be expected? One example is holding a heavy door open for a stranger entering a building behind us. How long should we wait? If the stranger is right behind us, we feel rude for letting the door swing shut. If the stranger is too far away, waiting a long time makes both parties feel awkward. Our minds calculate a threshold by comparing estimates of our cost of holding the door and the other person’s cost of re-opening it. We usually extend favors when the cost to ourselves is less than the cost we save for others. When everyone does this for everyone else, everyone wins. We often let a person with one item go first at the checkout counter when we have a full cart. But what if there is a long line of people behind us at checkout? If we give up our place in line, others will benefit, but our individual cost may become too burdensome. Such a large sacrifice is not expected of us; people understand that sometimes the first come, first served rule is the only fair and practical way to limit every individual’s burden to a reasonable level. Every bicyclist must decide for themselves on a case-by-case basis how much burden to shoulder for an inadequate road design, and how much to rely on the first come, first served rule to get to their destination in a reasonable time. In the Traffic Cycling class we discuss when a bicyclist should move to the right edge of the road to assist faster drivers in passing, versus when they should maintain control of their lane by riding in the lane center. For safety, cycling instructors encourage cyclists to control the lane when the usable lane width is narrow, because this reduces the risk of sideswipes caused by unsafe close passing. Bicyclists in North Carolina have the same legal right to use a full lane as other drivers. However, we also encourage cyclists to voluntarily move right at a safe location when the usable pavement is wide and it will help drivers pass by, letting them do so without changing lanes. Oftentimes one encounters marginal cases where the lane widens for a limited distance before narrowing again, and sometimes traffic backs up on narrow two-lane roads. In these cases, a bicyclist may elect to pull over where safe and wait until traffic disperses before continuing. So how often should a bicyclist do this? 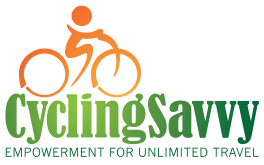 Pulling over too frequently creates an unreasonably high cost for the bicyclist in return for maximizing motorists’ convenience. Every bicyclist must decide for herself on a case-by-case basis how much burden to shoulder for an inadequate road design, and how much to rely on the first come, first served rule to get to her destination in a reasonable time. In the case of a group of cyclists, the logistics of moving everyone off of the roadway in a safe and coordinated manner can be particularly challenging. Usually a passing opportunity opens up and following traffic disperses long before a group can find a good place to pull over. One way that a group can make passing easier on a narrow two-lane road is to shorten the length of the group. This can be accomplished by riding double-file within a single lane, thus reducing the length of the group by half, and by riding in separated platoons of a dozen or fewer cyclists instead of in very large groups. Some roads feature paved shoulders, which in most states are legally optional for bicyclists to use. The width, surface condition, and continuity of such shoulders varies greatly, so bicyclists who consider using them to assist others with passing must continually evaluate the risks. Helping another road user pass a few seconds earlier is not worth a flat tire or crash. On roads with more than one thru lane in the bicyclist’s direction of travel, drivers can move into the left lane to pass with relative ease. On such roads, traffic almost never builds up behind bicyclists for more than a few seconds, so bicyclists usually need not concern themselves will pulling off the roadway to assist passing. 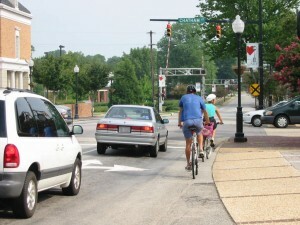 In urban areas with significant traffic, multi-lane roads are often the most advantageous routes for bicycling, offering everyone more convenience than narrow roads. 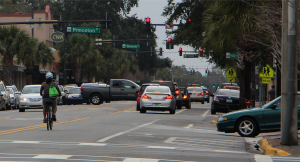 Passing stopped traffic on the right creates conflicts at intersections and frustrates drivers who must repeat their passing maneuvers. It is also prohibited by law in some states when not done in a separate marked lane. Where traffic queues up at traffic lights and stop signs, bicyclists can occasionally be seen squeezing past the queue on the right and moving up to the intersection. In some states, such as North Carolina, traffic law prohibits passing on the right when not in a separate marked travel lane. This rule is designed to prevent right-hook collisions between right-turning and overtaking traffic; right turns are to be made from the right lane and overtaking should only occur left of right-turning traffic. But beyond possible legal and collision concerns, filtering forward often creates a greater burden for the queue of motorists than it saves for the bicyclist. If the travel lane is narrow, it may be unsafe for motorists to pass the bicyclist again without moving into the next lane. Each motorist may wait behind the bicyclist, pass when safe, and stop at the next light, only to have the bicyclist squeeze past them again and repeat the whole process. 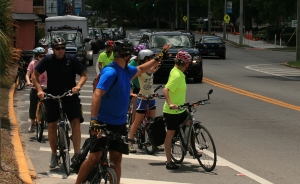 The safer and more courteous approach is for bicyclists to get in line with queued traffic and pass through the intersection on a first-come, first-served basis. When this group pulled over, the front riders moved forward far enough to ensure the rear riders could easily ride completely out of the travel lane before stopping. Then they offered a friendly wave to motorists who had followed them through a narrow stretch of road. 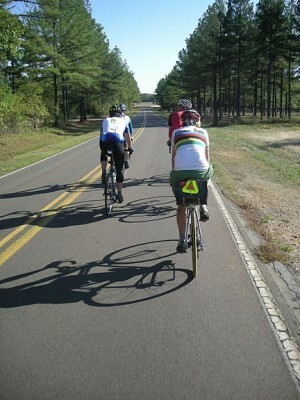 Groups of cyclists traveling together must sometimes stop for a short time to rest, re-group, or make route decisions. When a group stops in the roadway, however, other road users must figure out how to get around them in order to proceed. This is especially problematic if the group has stopped to chat at an intersection, where moving into the next lane to pass would be hazardous. If a cycling group stops and waits for a reason other than waiting for traffic ahead to clear, it is a simple courtesy to move the bicycles off of the roadway temporarily, and return to the roadway when the group is ready to continue. On paths, bicyclists should slow down and give pedestrians lots of space when passing, just as bicyclists need motorists to do for them on roadways. Some locations, such as greenway paths, are shared with pedestrians. Pedestrians value these spaces as safe and relaxing places to walk with their children and pets, and will sometimes make unpredictable movements. This requires bicyclists to slow down and give pedestrians lots of space when passing, just as bicyclists need motorists to do for them on roadways. When a path is congested or pedestrians are otherwise spread across the width of the path, the bicyclist must often slow down to pedestrian speed and alert the pedestrians to the bicyclist’s desire to pass. Although a bell can be an effective way to alert pedestrians who are not facing the bicyclist, a friendly voice may be better appreciated. It is also important to receive some form of confirmation from the pedestrian (such as eye contact) indicating that they know they are about to be passed. By making an attempt to understand the genuine difficulties faced by travelers other than ourselves, we can all promote civility. Debate often arises about courteous cycling when different people have different perceptions of the costs of the available options. A motorist may not see and appreciate the broken glass, gravel, broken pavement, rumble strip, door zone or other hazards present at the edge of a road. Some people are unfamiliar with the effective safety benefits of riding near the center of a narrow lane to deter unsafe same-lane passing. A bicyclist may not appreciate the challenges a driver pulling a trailer may face when preparing to pass safely on a two-lane road. Some debates will never be put to rest, and sometimes all the options seem equally bad. But by making an attempt to understand the genuine difficulties faced by travelers other than ourselves, we can all promote civility. Motorists often do not understand the reasons a bicyclist choses to ride where she does. 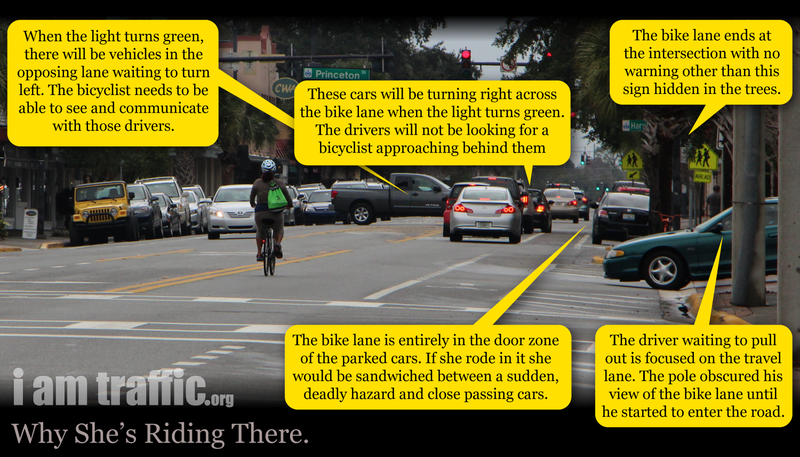 Click on the image to see the conflicts this bicyclist is avoiding. A markedly different kind of debate results when one participant believes that another has an inferior right to a shared resource because they belong to a lower caste or class of users, and should therefore defer to the superior group. This type of prejudice often fuels motorists’ complaints about bicyclists using roadways, and sometimes anti-car advocates for increased bicycling can be similarly afflicted. While there are solid legal arguments supporting equal rights to traveled ways, the most persuasive approach to resolving prejudice usually involves an appeal to humanity and development of mutual understanding. It’s important for bicyclists to view themselves as equally entitled users of our public roads, which means being equally entitled to safe travel. A bicyclist should never compromise her safety to increase convenience for another road user; that is too high a sacrifice to make. The prudent approach is to trade time and effort in an equitable manner to help everyone get to their destinations safely and in reasonable time. Suppressing the urge to argue can be difficult, but it is unlikely that a motorist’s mind has ever been changed by a yelling match. Occasionally a motorist who feels slighted by a bicyclist’s movement or simply their presence on the road will harass the bicyclist by yelling or horn honking. This can be very upsetting, and it may be difficult for the bicyclist to keep calm. Understand that the greatest danger in such situations usually occurs when the bicyclist escalates the situation by retaliating with their own yelling, obscene gestures, or other expressions that can be interpreted as hostile. Such exchanges can result in assaults. But if the bicyclist simply ignores the harassment, the motorist will usually continue on their way without incident. Suppressing the urge to argue can be difficult, but it is unlikely that a motorist’s mind has ever been changed by a yelling match. If a motorist behaves in a threatening manner, however, stop and report the incident to police as soon as possible. Take note of the license plate, driver description, and location, and be prepared with any witnesses or video that may be available. Note that video can be a very compelling and unbiased witness, and will also show any unlawful or escalating behavior on behalf of the bicyclist. Whenever interacting with other members of the public on our roadways, the most successful long term approach is ultimately to take the high road. Great article! I am currently on a cross country bike tour and just posted my thoughts on bicycle safety across the country. Here is the link to my video. Check it out and let me know what you think. It would be great to hear your comments, though I want to engage some motorists as well. Any suggestions on how to get them interested in this discussion? Very informative article. I am still in the process as a bicyclist to getting used to taking the lane. I partially feel a bit strange about it when I queue up to a red light and end up waiting between cars, smelling the exhaust of the one in front of me, and aware of the impatience of the one behind me. I ride a road with a bike lane and I do like to pass on the right at a traffic light, and stand in front of the line of cars as if there was a bike box. Cars then can pass me again without impunity because the bike lane and wideness of the road continues on. One thing I wanted to mention about the harassment section is that reporting is not that easy. Last time I tried the policeman at the station tried to find the form I could use, then failed, and then directed me to go to their website to get it, which I then didn’t find either. I still have the license plate number, but the reporting of it is becoming stale. Plus the policeman also told me they can’t do much more than calling the driver and telling them off – which might be useful and also might just further anger the driver towards bicyclists. Passing in a bike lane is usually legal, but can be perilous at intersections where a driver on your left might turn right. If there is a right turn only lane to the right of the bike lane, drivers on your left should be going straight, but still proceed slowly when filtering forward. 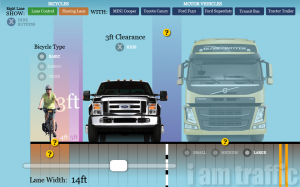 Never pass on the right side of a bus or truck could possibly turn right, because such vehicles make wide turns and can suddenly knock you sideways and run you over with their rear wheels after you could have sworn they were going straight. Verbal harassment is a legal gray area in many states, but threats of harm are clearly illegal, and police should handle them seriously. Report anything that concerns you, since most police want to have open communication with the public about such things, but understand that police will have limited options in some cases. It can be difficult to report poor driving, but it is worth the effort. If all that happens to the driver is that the police call, at least he is put on notice, and the police have a record of the complaint, so any subsequent report on that motorist will add to his record. At some point action may be taken. A while ago, I decided to try to educate the motorists who mistakenly believe that cyclists should “get on the sidewalk”; I photocopied the relevant pages from the NC DOT’s official driver’s handbook and kept the copies stuffed under my bike seat. A few times, I was able to catch up with the driver at the next traffic light, knock on their window, and very calmly hand them a copy of the driver’s handbook. Not successful — the drivers were always so angry at being called on their mistake that they refused to take the paper. So yeah, I don’t think there’s much to be gained from interacting with those drivers in any way. We need better motorist education campaigns (and no, those “Share the Road” billboards from WalkBikeNC don’t do the job). For the record, BikeWalk NC, the nonprofit advocacy organization on which I serve, has not sponsored or created any billboard advertisements. The only bicycling related billboards I have seen in NC were done by the Adam Little Foundation. Neither I nor BikeWalk NC had any involvement in those.